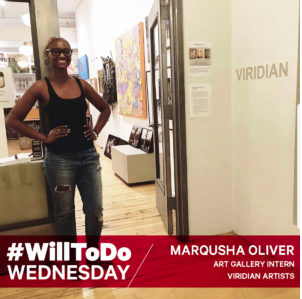 Southeast Missouri State University student Marqusha Oliver traveled to New York City this summer to intern in one of the city’s finest and most highly respected art galleries. Oliver interned at Viridian Artists Inc., an artist-owned, professionally operated gallery, located in New York City in the Chelsea region of Manhattan. The gallery is one of the city’s oldest artist-owned galleries housing contemporary art.